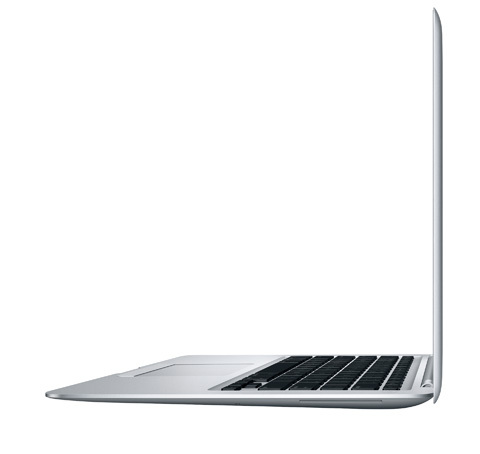 MacBook Air measures an unprecedented 0.16-inches at its thinnest point, while its maximum height is 0.76-inches. "We've built the world's thinnest notebook - without sacrificing a full-size keyboard or a full-size 13-inch display," said Steve Jobs, Apple's CEO. "When you first see MacBook Air, it's hard to believe it's a high-performance notebook with a full-size keyboard and display. But it is." 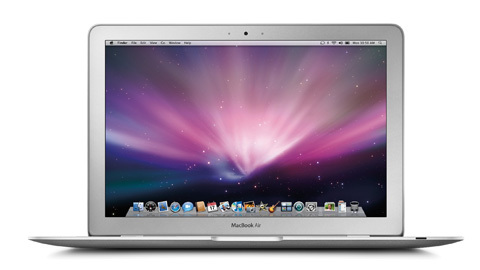 MacBook Air is powered by Intel Core 2 Duo processors running at 1.6 GHz or 1.8 GHz, and includes as standard 2GB of memory and an 80GB 1.8-inch hard drive. An optional 64GB solid state drive contains no moving parts for added durability. New notebook has 13.3-inch LED-backlit glossy widescreen display that is energy efficient, and its spacious trackpad offers multi-touch gesture support for pinch, rotate and swipe, making it more intuitive than ever to browse and rotate photos or zoom into web pages in Safari. The full-size backlit keyboard has a built-in ambient light sensor that automatically adjusts the brightness of the keys as well as the display brightness for optimal visibility. MacBook Air delivers up to five hours of battery life for wireless productivity and includes AirPort Extreme 802.11n Wi-Fi networking, which delivers up to five times the performance and twice the range of 802.11g. The new MacBook Air also comes with Leopard, the sixth major release of the world's most advanced operating system, along with iLife '08, the most significant update ever to Apple's award-winning suite of digital lifestyle applications. The new MacBook Air will be shipping in two weeks through the Apple Store (www.apple.com), Apple's retail stores and Apple Authorized Resellers for a suggested retail price of $1,799 (US).